Over the years, I've tried to make it a policy never to step foot outside without my camera in my pocket. This is because I never know what kind of interesting or exciting thing might suddenly happen, such as the cows playing tag with a magpie. Well the other morning I couldn't find my camera, so I shrugged and went about my usual barn chores. 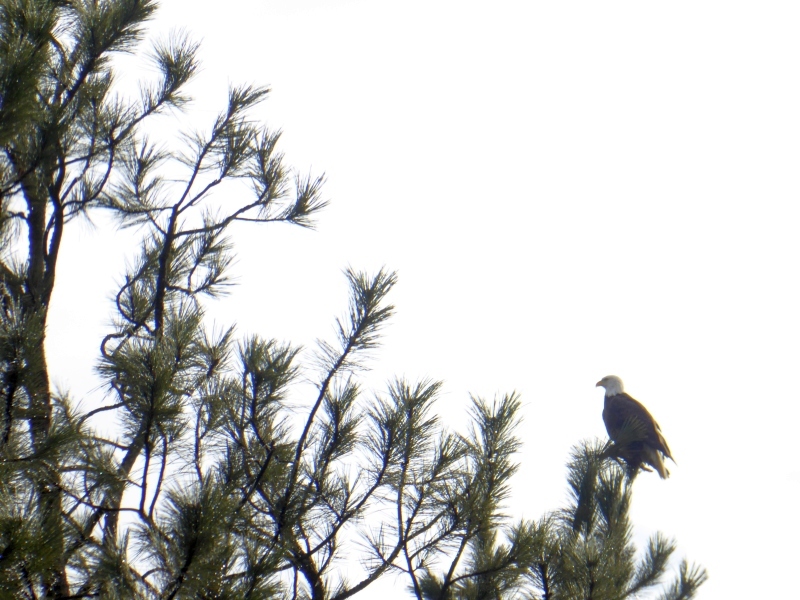 Then -- wouldn't you know it -- while I was standing in the corral filling the water tank, a bald eagle flew right over my head and landed on a tall pine next to the barn. And I didn't have my camera. It would have been a perfect shot. I was kicking myself for missing that photo, and once again promised myself to take my camera every time I step foot outside. 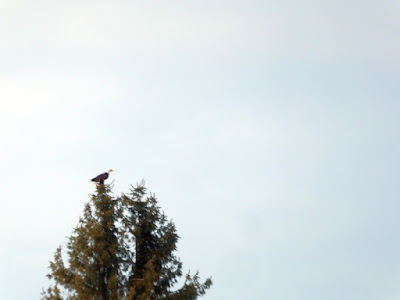 Which is how, while driving to town yesterday, I happened to see another bald eagle swoop in and land on a tree overlooking the road. This time I was ready. My usual procedure when faced with situations like this is not to worry about distance, blurriness, or shooting through the car's windshield (as I was doing). It's just to point and shoot at first, then later try to improve the situation and get better photos. That way, if (in this case) the eagle flew away before I could get closer, at least I had a long-distance blurry photo through the car's windshield. 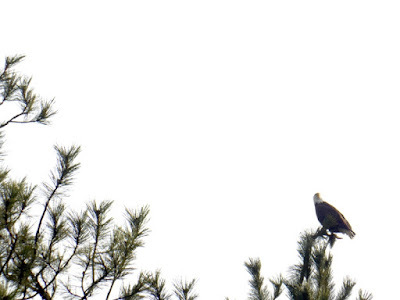 But the eagle stayed put as I got onto the highway, so I stopped on the shoulder nearer the tree. I took a few photos, more or less identical, then proceeded into town to do my errands. But on the way back, the eagle was still there. 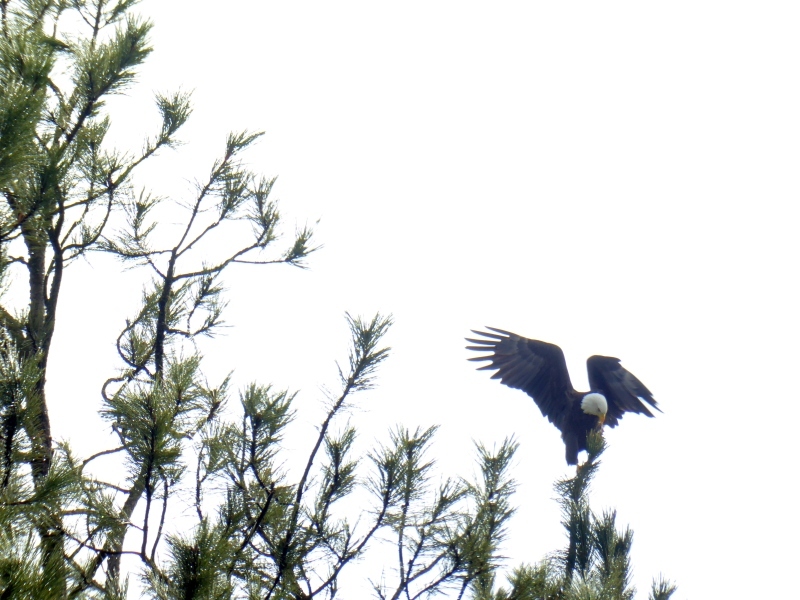 Feeling satisfied I at last got my eagle photo, I went on my way. I got barely a hundred yards down the road when yet another eagle swooped in and landed on a tree across the road. Y'know, I really love living in Idaho. And it sure helps having a camera. look around. with that many eagles around, I would bet there is a nest hidden high in an old strong tall tree. 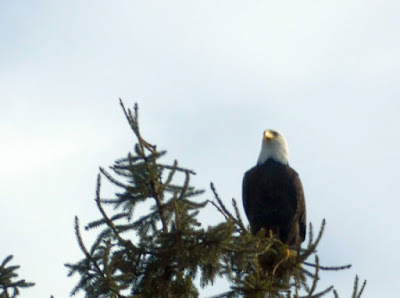 if you find one, take pictures but tell on one, or you will be overrun with "bird tourists"
They having been hanging tight along the big river in town (about 8 miles east) AND circling around the tributary out here to the west. Have gotten close ups of an immature in a road ditch and have had sightings circling out west in the past 3 months. One flew right over our barn in the past two weeks. I always have to try to get a look. My heart skips a beat when I see one! Oh how terrible. I hope they are able to fine the creep. Fantastic shots, Patrice! Such a majestic bird! Even here is Pennsylvania the beautiful bald eagle is making a strong comeback. Saw one flying on Christmas Day above my back field. 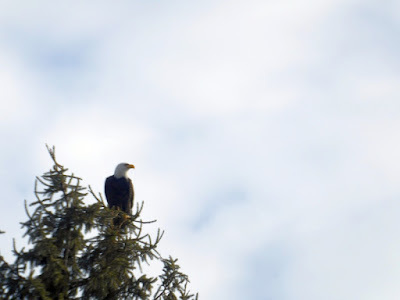 We just saw one fly over our home here in southwestern Ontario yesterday. Quite a thrill for our 11 yr. old who spotted it! We heard this past summer at a raptor exhibit about the great comeback the bald eagles are making in North America. I certainly never saw one as a child in Minnesota except in a zoo, and never in the wild in my life until a couple of years ago here in ON. 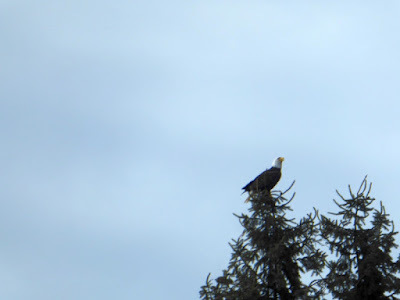 Bald eagles winter here in southern Oregon and we also have a couple of nesting pair here in the summer. I am always awestruck when I see one. They are beautiful birds. I always consider it a blessing whenever we get to see one in the wild. This usually happens when we are traveling rural highways from Colorado to North Dakota to visit the grandchildren. With or without a camera, noticing is a fine trait with subtle, simple rewards. We work hard to instill noticing/slowing down in our children. We were rewarded by seeing a juvenile bald eagle near our home in north Houston last winter. Then between our main home and our rural property, there have been the beaver, the praying mantis, the copper head, the thirty some odd unique dragon flies over the pond, the velvet ants, the bats, the fireflies, the hawk flying over head with a writhing snake in its talons...well, life in all its glorious forms. Noticing and being in wonder of our finds binds our family. 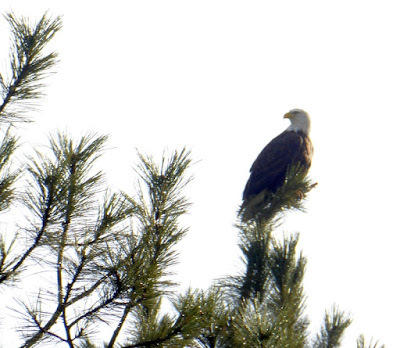 There is a pair of bald eagles on the property next to my parents' land in North East Texas. When the land on a tree outside their cabin, all activity comes to a stand still as we watch them in awe. A local timber processing plant down the road from me has a huge back lot. He has been collecting deer road kills and putting the carcasses out on the edge of the lot. We do have quite a few road kills here. Anyway, these carcasses attract local eagles in large numbers. I would not be exaggerating to say the I have see as many as 20 at one time. It is quite the sight. I miss seeing the eagles!! 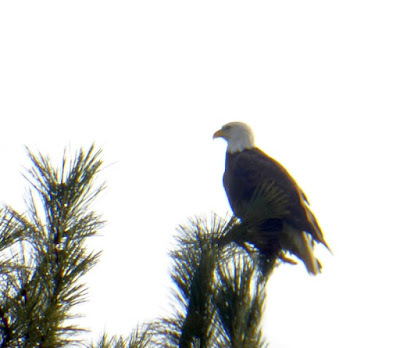 Enjoyed your eagle pics, wish you would post more often. Beautiful photos as usual Patrice, thank you for sharing them. It's been so wonderful to see their numbers climb, they seem to be doing quite well. So well in fact, I now see them all the way down in San Diego Ca. We have several pairs around the county. The first time I saw one (flying over a lake snagging a fish no less) I had to do about a quadruple take, I could hardly believe my eyes!